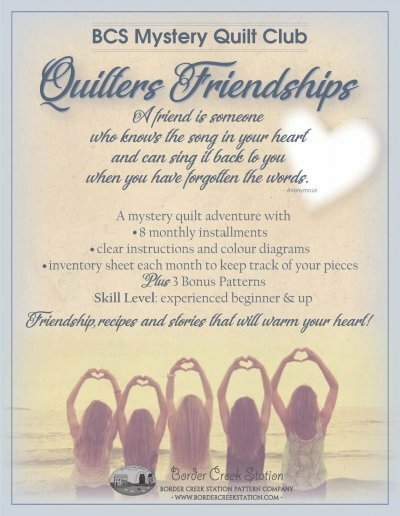 Please join us as we make the 2018-2019 mystery quilt, Quilters Friendships, by Border Creek Station featuring Moda fabrics. This is a mystery quilt adventure with monthly installments, clear instructions and color diagrams. You will receive an inventory sheet each month to keep track of your pieces. A pattern with clues for each month are included with the $7.00 class fee. Plus you will receive 3 bonus patterns throughout the year. Kits will be available in two fabric choices or choose your own! Skill Level: Experienced beginner and up. Queen size: 104" x 104"
Lap size: 70" x 98"
Requirements: Kits offered in two colorways for an additional cost or you can purchase fabric of your choice.